When looking to improve your home, we know you have a huge amount of choice. Doors and windows today consist of a big number of brands and a lot of information for you to digest. Often homeowners are confused as to what are the best products, brands and solutions for improving their home. If you want to replace your existing windows and doors or embarking on a renovation project, we are the people to talk to. At Newlite Home Improvement Ltd, we pride ourselves on being different to other window companies. By far, our strength is our personal service. Helping you understand new windows and doors. What do energy efficiency labels mean? What is best, a folding door or a sliding door? Should I have aluminium or PVCu? How disruptive is having my windows replaced? What guarantees and peace of mind is available? We take a headache out of choosing replacement or new windows and doors. Talk to us and find out what all the different products mean. Furthermore, we help you choose the most suitable product for your budget, property and requirements. Newlite Home Improvement Ltd is a local home improvement company and you benefit from more than 25 years of experience. We know our windows and doors general home improvements, conservatories and building work. Therefore, whether you are looking for a single window or an entire project, talk to us. Newlite Home Improvement Limited is lead by Alan Burden. Alan has over two decades of experience. Alan knows products, installations, customer service and the industry as a whole. When speaking to Alan, you are benefitting from all his years of knowledge in PVCu, aluminium and timber windows and doors. Best of all, for a new conservatory or refurbishing your existing structure, Alan has a huge amount of knowledge. Speak to us and benefit from honest, impartial and expert advice. Importantly we listen to your requirements and work with you to create your dream home extension. Personal service is also at the heart of our business. As a local company, our name means everything. We also work to dispell many of the myths around home improvement. Furthermore, we strive to change the traditional image and perception of home improvement companies. 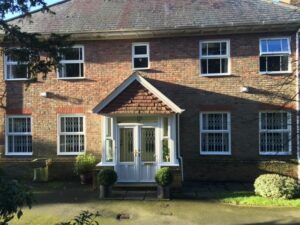 Here are some ways why Newlite Home Improvement Ltd are different from typical double glazing firms. Newlite are your local home improvement professionals. Our work comes from serving the local community. Your initial consultation will be dealt with by Owner/Managers. We do not employ commission only salespeople. Often these are employed by other firms and incentivised to “close the sale” and secure new business. Many homeowners rarely see the ‘salesperson’ after placing an order. At Newlite you deal with senior members of staff at all times. Finally, we will visit you at your home to establish your requirements. Furthermore, we advise you on the right products for your project, provide a quotation and answer all your questions. Our pricing is fair and transparent. At all times our quotes are honest, without sales gimmicks or “buy one get one free” offers. There are no false incentives and bogus discounts to entice you to commit. Therefore you know you are buying right. Our staff are ethical and professional putting products and service at the core of what they do. Other window companies limit their product range. We believe in offering the right products to suit your home and individual requirements. Almost all properties are different. As a result, we have access to virtually every product in a choice of materials. We also have the knowledge and experience to advise you on what will be right for you and your home. Contact us to change your old windows for new. We provide the latest contemporary aluminium windows, heritage style windows for traditional homes or the ultimate in folding sliding doors and glazed roofs. With all windows and doors being made to order we understand that communication is key and especially after you have paid your deposit. Throughout the survey, ordering and manufacturing process we will communicate with you and update you regularly about your order with us. With many homeowners embarking on extensions and renovation projects we understand how important it is for timescales with your builder and other trades to run on time and that windows and doors form a key part of the build process. Our installers are smart, clean and trained to work to recognised industry best practices and procedures. Our installations ensure the highest standard or workmanship and care for your property. Finally, we do our utmost to work in a safe, clean and caring way respecting your home. We are a CERTASS registered company registering all installations upon completion. Contact us for personal service, honest and transparent advice and a free no obligation quotation.